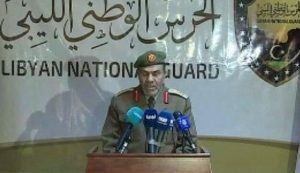 The Libyan National Guard (LNG) has announced that it is joining the Benghazi Defence Brigades (BDB) and the Misratan Third Force in the south in the fight against the Libyan National Army (LNA). The LNG militia was formed in February by Khalifa Ghwell, prime minister of Libya Dawn’s National Salvation Government. Today its leader Colonel Mahmud Al-Zaghel denounced armed forces commander-in-chief Khalifa Hafter as a criminal intent on imposing himself as Libya’s military ruler. Zaghel said that the LNG was setting up an operations room dedicated to combatting “terrorism and criminality”. He added that the LNG was expanding across Libya and would stand side-by-side with any security force seeking impose stability and security in the country. It is unclear if any LNG militiamen have yet joined the Misratan Third Force and the BDB in the conflict areas around the Tamenhint air base.